Growing up in the Seattle area, I loved Disney movies, Marvel comics, and was mesmerized by Star Wars film. I became interested in computers and digital art in junior high school, where I went in early each morning to teach myself Photoshop in the computer lab. During my senior year, I began studying film at the local college and was captivated by the visual effects in movies coming out at the time, like The Matrix and Star Wars: Episode One. I received a scholarship to The Evergreen State College, and there I continued to study film, along with screenwriting, theater, and psychology. I worked on the college paper as an ad designer, and got the chance to interview "The Simpsons" creator and Evergreen alum Matt Groening when was the commencement speaker for the class of 2000. As much as I loved Evergreen, I decided not to return for another year, because by then I had seen Toy Story 2, and the urge to work in film animation had become too strong. Although I had no prior experience with 3D Animation, I submitted my 2D portfolio and a handful of 3D renders to The Vancouver Film School, and I was accepted into their 3D animation program. At VFS, I had lessons ranging in classical animation, Softimage, acting, cinematography, and character creation. After graduation, I was awarded a three-month scholarship extension and refined my student film "B-Boy" so it could play in film festivals worldwide. I also began learning Maya to animate characters on a classmate's modeling reel, then worked with two other classmates to make a commercial and two intros for the Los Angeles International Short Film Festival. After film school, I was hired by Chicago videogame developer Studio Gigante to animate for the Tao Feng: Fist of the Lotus and Wrestlemania 21 games. Working in bustling Chicago was incredibly inspiring , and it was there where I soaked up numerous local standup and improv comedy shows--eventually giving standup comedy a try myself. After Studio Gigante came Rockstar San Diego, where I first worked on Rockstar Games Presents: Table Tennis. Thereafter, I worked as the Lead Cutscene Animator for the racing game Midnight Club: Los Angeles, and flew to New York for motion capture sessions. Next came the Western sequel Red Dead Redemption, where I applied the knowledge I had gained throughout the years to flesh out areas like the game’s vast ambient world, player animation, and cutscenes. RDR2 went on to become one the fastest-selling and most critically-acclaimed games of 2010, earning the coveted "Game of the Year" award. In 2010, I finally took an opportunity to follow my longtime dream and passion to work on feature films. I moved to Los Angeles to begin work as a previsualization artist, using the filmmaking, art, and 3D animation skills I had obtained over the years. By 2012, I received my first feature film credit on Marvel's The Avengers. Seeing it on the big screen was a dream come true, and it has continued to be a joy to work on movies ever since. How I looked through the Tandent software at their Siggraph booth, 2010. 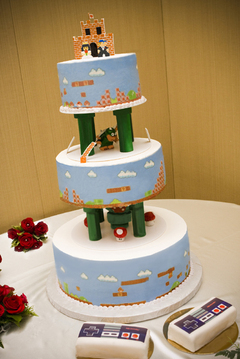 My wife's and my Super Mario Bros. wedding cake. © Jen Bosma Photography, 2008. 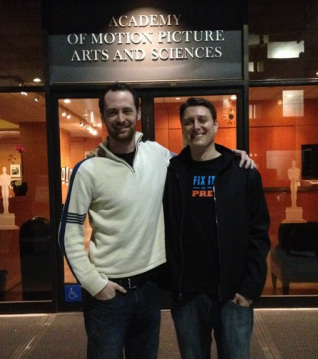 Outside the Sam Goldwyn theater after the Avengers crew screening, with fellow comic co-creator Sean, 2012. With my wife Tina and our daughter at the Scripps Aquarium, 2016.